Heads Up: Over the next year, the west end of Benfield Rd. in Severna Park/Millersville is going to be clogged up, literally. 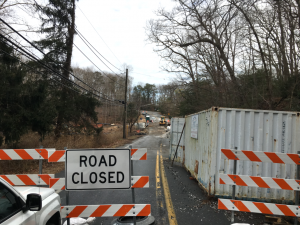 All the road work and congestion is due to a dam removal project on Bear Branch, meanders through the Shipley’s Choice, Crain West, Ben Oaks and Point Field Landing communities. It goes from Benfield Blvd. to Veterans Hwy. It is a shortcut for those who turn south onto Veterans Hwy. from West Benfield Blvd. or turn east on Benfield Blvd. from Veterans Hwy. West Benfield is currently blocked by construction related to the replacement of the Bear Branch culvert under the road. This culvert is currently a 66” pipe and will be replaced by a seven-foot high by ten-foot wide culvert pipe. The culvert is downstream from the Shipley’s Choice Dam, which is being removed. The dam is 20 feet high and about 200 feet long. It is an earthen embankment, constructed in 1980 to create in in-stream stormwater management pond for the Shipley’s Choice subdivision. Once the dam embankment is removed, a larger culvert is needed to safely pass stream flow under West Benfield Road. In 2006, an enlarged wet area was discovered on the dam’s downstream slope prompting emergency corrective work. Further engineering evaluations determined that long term repairs would not be effective and the process of planning a project to remove the dam began. The first plans were rejected, so planning started over. 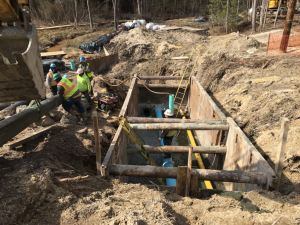 Now the project has two pieces; the installation of the new culvert under West Benfield Rd to allow for a more stable stream flow along Bear Branch, and the removal of the dam embankment. 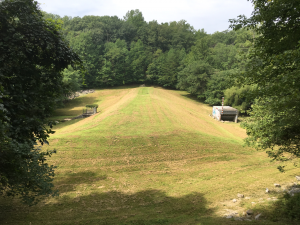 Much of the dirt from the dam will be reused to decrease the slope of the hills along the Bear Branch floodplain and will be planted with trees and other vegetation. This piece of the project will begin in September 2019 and finish in February 2020. Why does the culvert replacement take so long? Weather is the biggest obstacle: 2018’s record rainfall has saturated the ground, and rain continues in early 2019. Much of the construction requires excavation, and wet muddy conditions will continue to hamper progress. The culvert replacement requires moving utilities: electrical, gas, water, sewer, telephone, and cable. The contractor installed new poles and BGE has moved its wires, but the contractor is still waiting on Verizon. Progress has been made on a bypass sewer line. Around the clock pumping was required to keep the work area and trenches dewatered. The utility bypass project should be completed by May 2019. At the same time, work has been done to divert the stream itself to allow for the installation of the new culvert as well as dry out the ground in the area. There is a generator pumping water 24 hours a day, but still moving the construction related vehicles and equipment around is tricky. One unexpected delay was the discovery of clay that required the installation of a water tank for turbid water treatment. The contractor, Paydirt, is doing a great job with respect to maintaining the Bear Branch stream. It is running very clear most of the time. The actual installation of the new culvert will begin in June. Because of the soft, soggy ground, 78 concrete piles will be driven into the ground to support the new culvert. This activity will take place in July. Nearby houses have been inspected in case seismic damage occurs.